La Salle's B.J. Johnson dunking against St. Bonaventure during the first half on Tuesday. 2 p.m., Tom Gola Arena. Coaches: George Mason, Dave Paulsen (3rd season, 43-49; overall, 177-143); La Salle, John Giannini (14th season, 209-223; overall, 502-372). Series: George Mason leads, 3-1. Last meeting: With Marquise Moore scoring 28 points, George Mason defeated the visiting Explorers, 95-75, on Feb. 4, 2017. The latest: George Mason is seeking its third straight win, after Wednesday's 85-67 home win over Dayton. … Four players average in double figures for George Mason, led by 5-foot-11 junior Otis Livingston Jr, who is averaging 17.4. … The Explorers are looking to snap a three-game losing streak, after Tuesday's 79-68 home loss to St. Bonaventure that came despite a career-high 22 points from 6-4 sophomore Saul Phiri. 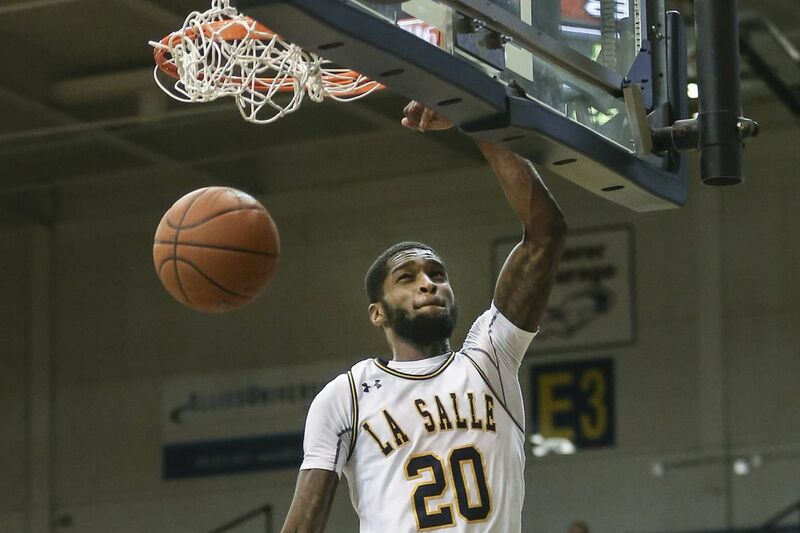 … La Salle senior forward B.J. Johnson leads the Atlantic Ten in scoring, averaging 20.6 points. 4 p.m., David S. Mack Sports and Exhibition Complex, Hempstead, N.Y. Coaches: Drexel, Zach Spiker (2nd season, 20-40; overall, 122-152); Hofstra, Joe Mihalich (5th season, 85-75; overall, 350-278). Last meeting: Despite 25 points from Tramaine Isabell, Drexel lost to the visiting Pride, 91-86, on Jan. 13. Rokas Gustys, a 6-9 senior, had 20 points and 16 rebounds for Hofstra. The latest: Drexel lost it third in a row in Thursday's 75-69 defeat at Northeastern. … Isabell scored 24 points in Thursday's loss, and he leads the Dragons with a 20.0 scoring average. … Drexel 6-8 senior Austin Williams, who missed the Dragons' previous game with a lower leg injury, returned Thursday and had six points (3-for-3 shooting from the field) and four rebounds in 15 minutes. … The Pride beat visiting William and Mary, 90-84, Thursday as 6-5 sophomore Eli Pemberton scored 26 points, and Gustys added 22 points and 21 rebounds. …. Against William and Mary, Justin Wright-Foreman, a 6-1 junior, had 19 points and a career-high seven assists. Coaches: Jay Wright, 17th season at Villanova (408-164); Chris Mack, 9th season at Xavier (210-94). Last meeting: Led by Phil Booth with 21 points, the Wildcats shot 55 percent from the field and captured an 89-65 victory on Jan. 10 at the Wells Fargo Center. The latest: The Wildcats made a season-low three three-point baskets and tied a season high with 19 turnovers in a 76-71 loss Wednesday at Providence. … In their last three games, they have connected on just 24 percent (17 of 71) of their attempts from beyond the arc. … The Cats have won at Xavier in two of the last three years. … With a win Saturday, Xavier will be two games ahead of Villanova in the loss column with three games remaining, giving the Musketeers a great chance of ending the Wildcats' run of four straight Big East regular-season championships. … The Musketeers average 24 free-throw attempts, eight more than their opponents. Coaches: Phil Martelli 23rd season at St. Joseph's (425-307); Keith Dambrot, 1st season at Duquesne (15-11, 428-220 overall). Series: St. Joseph's leads, 39-14. Last meeting: The Hawks recovered from a double-digit deficit in the second half and closed the 2016-17 regular season with a 63-60 win in Pittsburgh. Chris Clover and James Demery each scored 19 points for the Hawks. The latest: The Hawks beat Fordham to win consecutive games for just the fourth time this season. James Demery had 20 points and six rebounds, and Shavar Newkirk added 19 points and seven assists as they picked up their first conference road win. A win would give St. Joe's its first three-game winning streak. … The Dukes have lost three straight and five of their last six games. … Duquesne has not played since last Saturday and are led by sophomore Mike Lewis II (15.3 ppg) and freshman Eric Williams Jr (14.3 ppg). 6:30 p.m., Newman Arena, Ithaca, N.Y. Coaches: Penn, Steve Donahue (3rd season, 41-39; overall, 241-253); Cornell, Brian Earl (2nd season, 17-33). Last meeting: AJ Brodeur had 18 points, nine rebounds and six assists as Penn earned a 69-61 win over Cornell on Jan. 12 at the Palestra. The latest: Stone Gettings, a 6-9 junior, had 20 points and 17 rebounds in the earlier loss this season to Penn. … Cornell 6-2 junior Matt Morgan entered the weekend leading the Ivy League in scoring (22.8 ppg.). … Cornell is last in the Ivy League in scoring defense, allowing 79.7 points per game. … Penn has won 10 in a row over Cornell and six straight at Newman Arena. … In Penn's earlier win over Cornell, the Quakers held Morgan to 13 points on 4-for-16 shooting. … Before losing last Saturday at Harvard, Penn started 7-0 in the Ivy League for the 14th time in school history but first since 2005-06.